This is Miss Pumpkin. 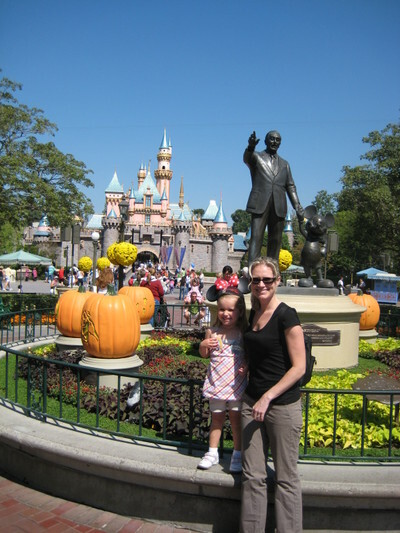 She lives in Disneyland. 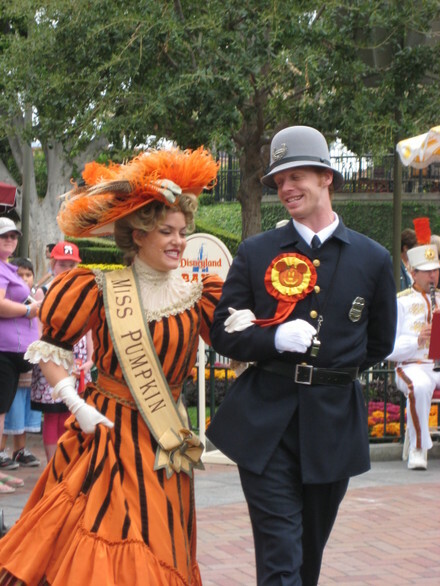 I'm not sure where exactly she lives in Disneyland, but I do know that she dates the local constable. 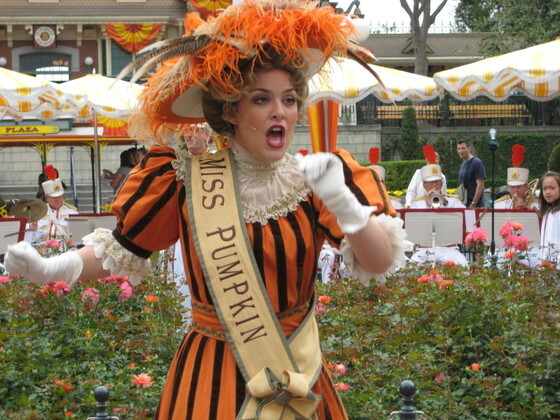 I very much wish that I lived in a town with a Miss Pumpkin who dresses like this one, and sings and dances. Aren't they cute? Also, can you see in the back ground of the first picture, the guy in the dark blue t-shirt standing over on the right side - sort of posing like Big Foot walking through the forest (not that he resembles a Sasquatch) - that's Steve who just happened to be in the picture and we didn't realize it until much later. I was following Miss Pumpkin around while she was dancing so that I could get a good picture of her and I guess I got quite a ways from where we had been standing. I had to share Miss Pumpkin with you before Halloween had come and gone. Jeez that's a great costume. 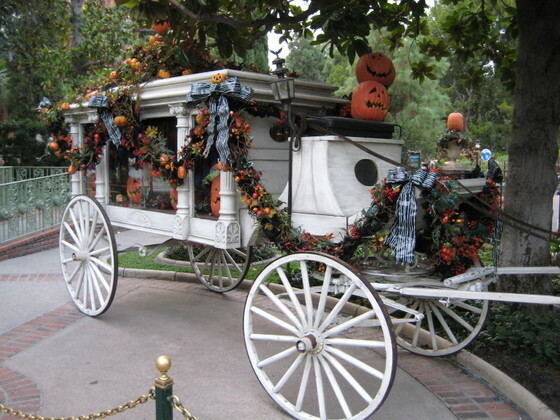 This was another great Halloween display at Disneyland. 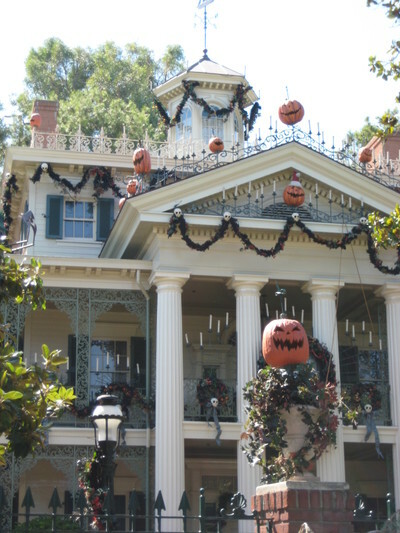 They do a really good job of decorating - it actually increased my enjoyment level even more to see all of the Halloween decorations while we were there. 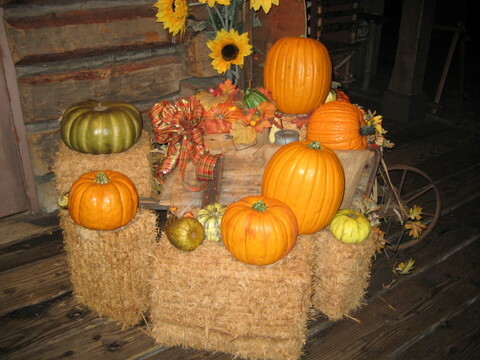 And, back at the ranch - the dining room table. 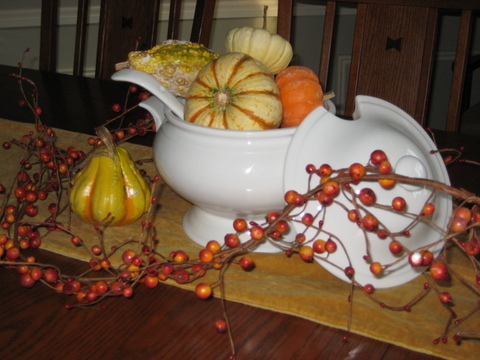 I just realized that the gourd on the table, to the left looks like it's plastic, but it is real - sheesh, could it be more shiny? Little hanging black cat. 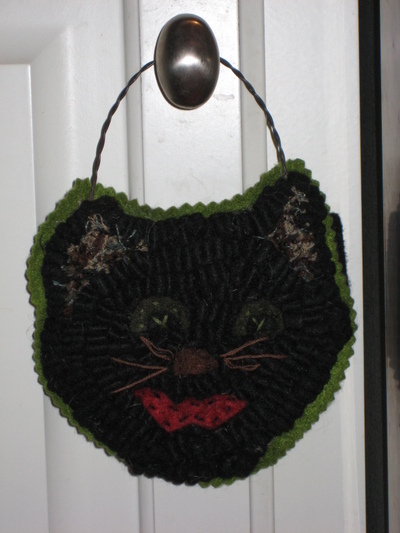 He's made the same way as a hook rug - I did not make him though. Heck, I can't even remember where I got him. Yes, my memory is like a finely tuned machine. 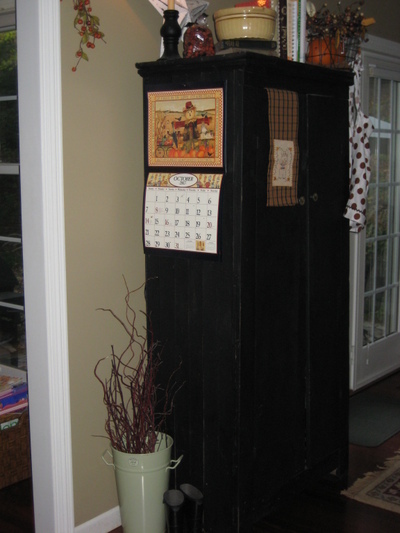 Another cabinet picture from a different angle - as seen a couple of posts ago. My grandpa got me that calendar and I like the pictures so much. I can always depend on my grandpa to get me a very cute calendar for the kitchen. I just realized that I was going to show pictures of the journal that I did for Shelley. I'll show it/them in the next post. I say them because somehow I ended up doing two - because I can't let things alone. One became two and that's how it went. Also, did want to report back that I think my memory is improving (despite not remember where black cat hanging guy came from). I've been doing Sudoku every night before bed and really concentrating on making myself remember names and details. Anyhoo, just wanted to let you know that I think it's paying off. And I'm getting a lot better at Sudoku too. Sometimes for fun I'll see how fast I can do an easier one (like a one star). Friday night I did one in three minutes. I'm working on a four star Sudoku now. My life is riveting. A real nail biter of a blog. I can see why you stay tuned. What will she do next ? - will it be Sudoku, watching High School Musical again, wait, hold on, maybe she'll be petting her cat with the left hand instead of the right. It's almost too exciting. Until the next unpredictable post, I hope you and your families are well. Hello my friends! 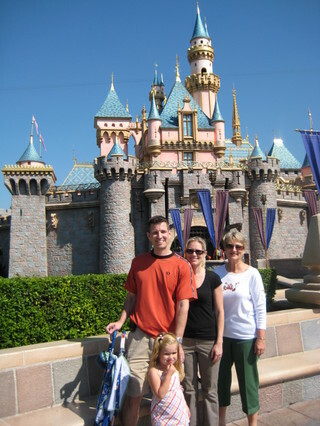 My family and I just got back from a week in Anaheim, CA. My mom met us down there as well and we had a great time. 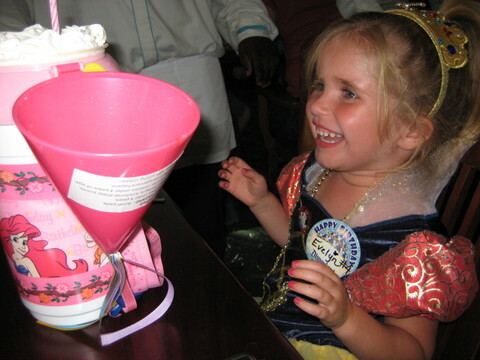 While we were there we celebrated Evy's 4th birthday, spent three days at Disneyland, went to the ocean, visited Hollywood, and of course found time for antiquing. It was so much fun, and always tough to come back to the norm of work and day-to-day stuff that isn't nearly so fun. I wanted to let you know ahead of time that I was going to be in California, but unfortunately our car was broken into right before we left, and multiple things were taken, including our checkbook with address. In addition was Steve's planner, which had a packing list in it - needless to say, we were very concerned about leaving our house when thieves had our address so I didn't feel comfortable announcing our time away. 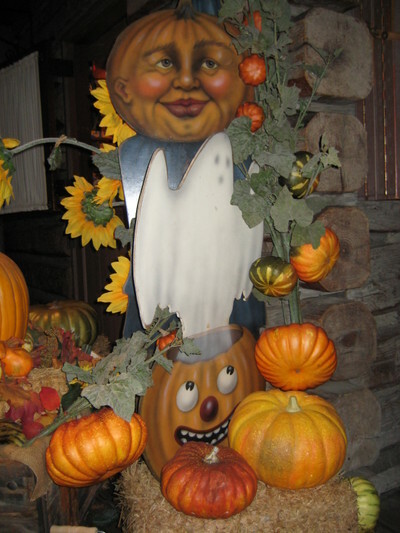 I'm including a few (many) pictures from our trip - specifically some of Disneyland and the fall decorating they did there. I loved it! There's just something magical about this castle, especially at night when it's all lit up. Some of the Disney decorations were sweet - like this one. Others were a bit more sinister. 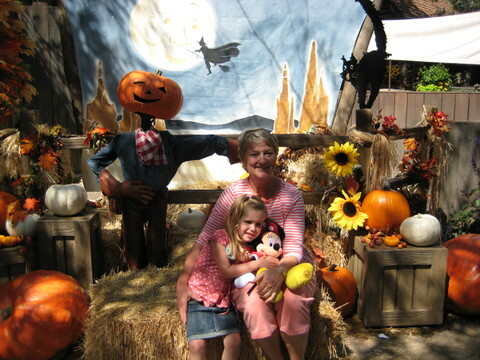 Mom and Evy with more sweet decorations. Can you see those beautiful hanging mum baskets. They're big mum balls. Evy was more of the "admire Mickey from afar" school of thought. 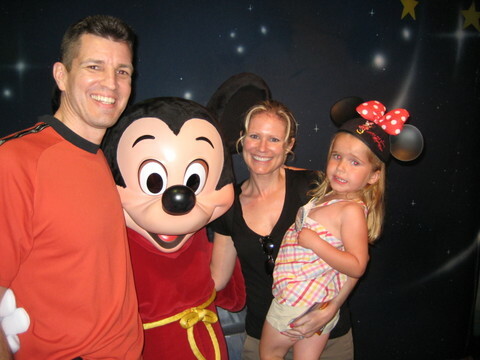 She was all talk while in line, but when it came right down to it, she was just too afraid to hug giant mice, bears named Pooh, and Mad Hatters. Princesses were okay though - she was all about the princess hugs. 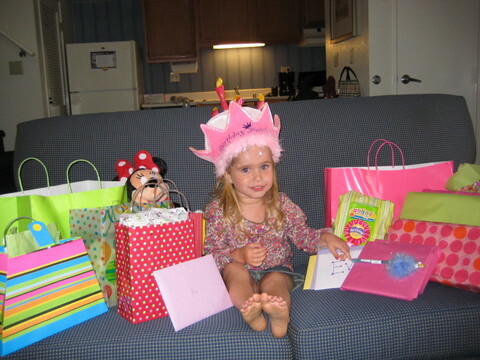 This was in our hotel room on Evy's birthday. Up next, princess hugs. 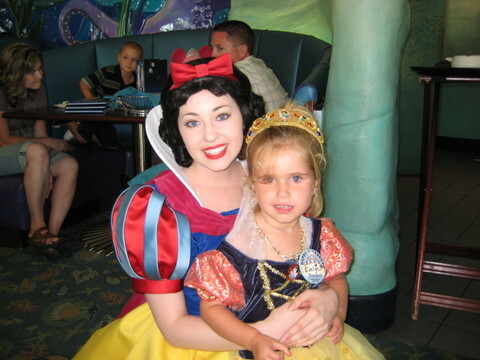 Snow White with Snow White. Such a special day for all of us. When we weren't at Disneyland, we were doing lots of other fun things - antiquing being one of them. I'll show you some of the fun things I got once I get them into position. I hope you all had a good week. I'm back to work tomorrow for one day, and then flying back to California on Tuesday for the rest of the week for work - this time San Jose. I'm sure it will be fun, but it tires me out thinking about hopping back onto a plane and doing the hotel thing again. I'll have some down time at night though, which will be nice. Thanks for indulging all of the pictures. You may see a few more here and there in future posts.